Wiltshire Music Centre’s Box Office is open 10am to 6pm Monday to Friday and from 2pm on the day of a weekend concert (10am for a morning or afternoon concert). The building is often being used and enjoyed outside of these hours but we advise that you call ahead if you would like to visit outside of Box Office hours. The Centre is located on the Bath side of Bradford on Avon and is sign-posted throughout the town on brown tourist destination signs. The Centre has free on-site parking. One car park is located off Churches on Winsley Road and is open in the day and evening, with disabled spaces for blue badge holders. A second carpark is located on the St Laurence school site off Ashley Road and is open in the evenings. We encourage visitors to lift share or travel on public transport where possible. 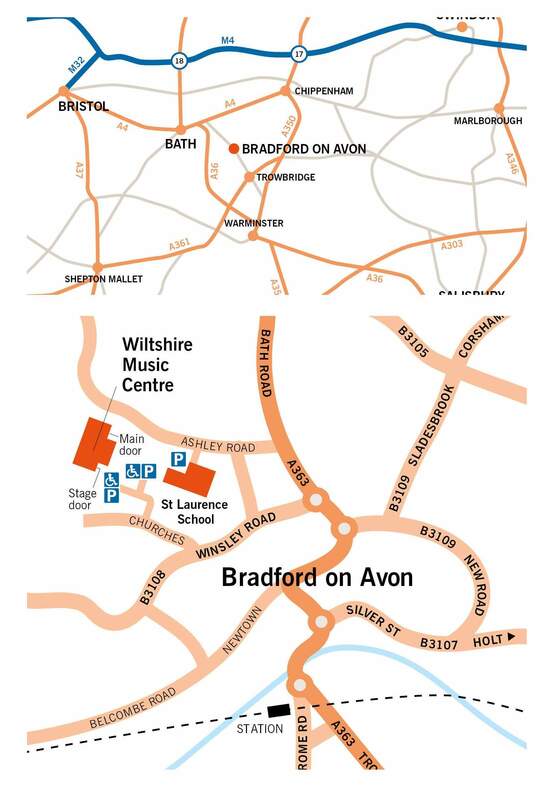 Bradford on Avon Rail Station is a 20 minute walk (uphill to the Centre) or a short taxi ride away. Taxis are available in front of the station. The D1 bus service travels between Bath and Salisbury, via Bradford on Avon, Trowbridge, Westbury and Warminster. Ask for the 'Churches' stop on Winsley Road. From this stop, walk up 'Churches' until you see a brown sign pointing you in the right direction. A bike rack is located in the car park off Winsley Road. Please note that there are limited spaces. St Laurence School, our neighbour and close partner, is currently undertaking a major upgrade to their science department, which will involve closure of the short pathway linking their primary car parking area with the Music Centre. As such, for the duration of the building work, it will no longer be possible to access the Music Centre via this pathway. 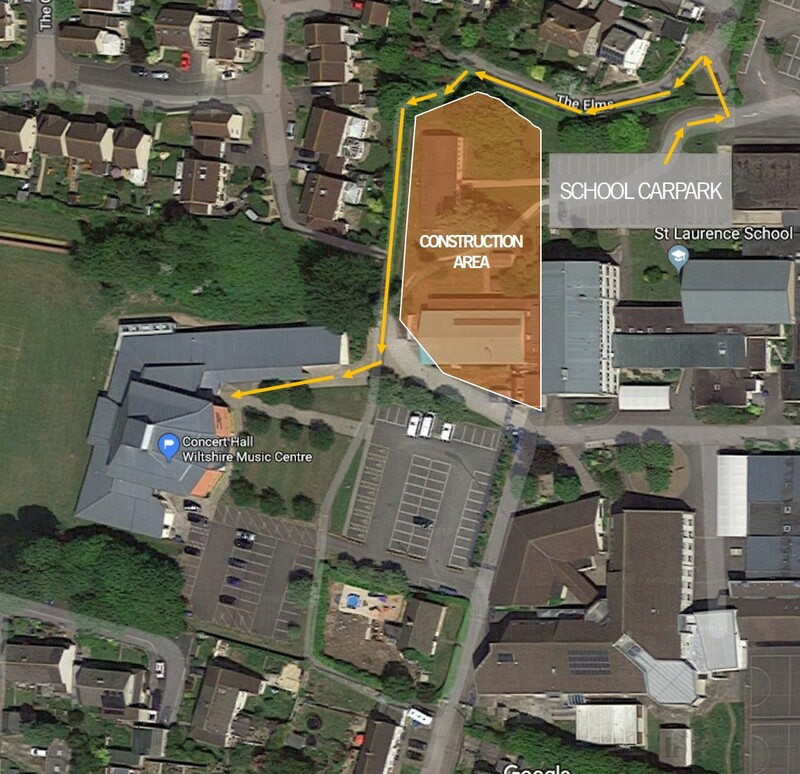 There is, however, a public footpath between the two areas which does allow access between the school and WMC, which will act as the temporary route between the two sites for the duration of the construction work. The footpath runs along the edge of the school car park, following the route of The Elms road. Please look out for the new signage directing you to and along the new route between the two sites. Please see the map below which describes the new route to be followed. We would like to strongly encourage anyone with special access requirements to park in the main car park by WMC, which is level with our entrance door, as the public footpath is not adequately accessible for wheelchairs. Thank you very much for your understanding regarding this matter. If you would like any extra information about the route and parking, or have any additional access concerns, please do not hesitate to get in touch by calling or emailing our Box Office, and a member of our team will be more than happy to assist you. Everyone is welcome at Wiltshire Music Centre and we aim to be as accessible as possible. Read about our recent tour to the South of France with the West of England Youth Orchestra (WEYO) and the Wiltshire Youth Jazz Orchestra (WYJO).